James is shooting the deep three better than anyone has since at least 2000. LeBron James is on fire from beyond 28 feet. It’s well-known what LeBron James can do at the rim. His size, strength and ability to absorb contact make him arguably the best scorer at the game’s shortest shots. 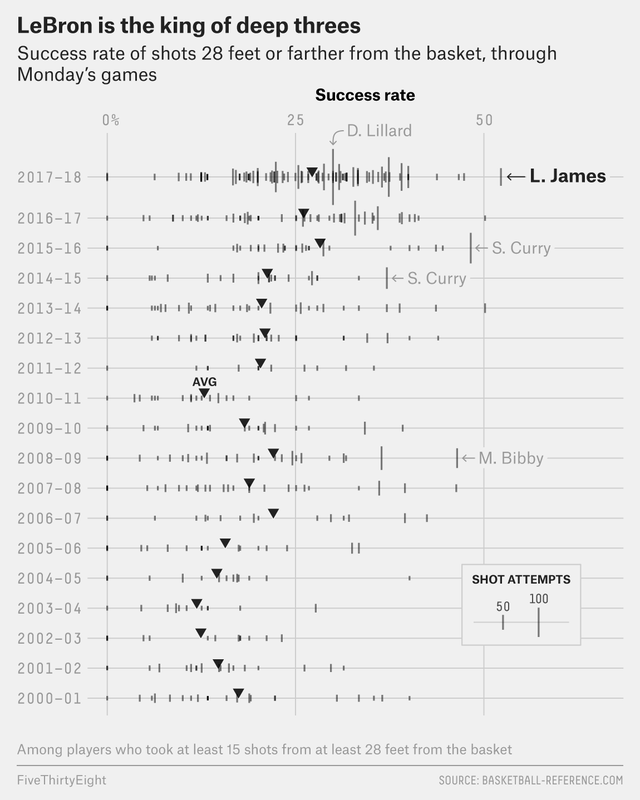 But this season, he’s establishing himself as the best at the game’s longest shots, too. The 3-pointer from way deep is the trademark of Steph Curry, and yet it’s James whose precision from several steps behind the arc is on pace to break records. Through Monday, James has made 52.3 percent (23 for 44) of his shots from 28 feet or farther from the hoop,1 according to Basketball-Reference.com. That’s not only the best this season among players who have taken at least 15 of those shots, but it’s also the best anyone has shot from that deep since the 2000-01 season, the furthest back play-by-play data is available on Basketball-Reference.com. Even Curry’s other-worldly 2015-16 season, in which he routinely rained threes on opposing defenses shortly after crossing half-court, can’t compare to what James is doing this year. It wasn’t that long ago that shots from 28 feet or farther were rare because hardly anyone could make them. In the 2000-01 season, 23 players attempted at least 15 shots from that far out, and as a group they made only 17.4 percent of those attempts. This season, 90 players have a collective field-goal average of 27.2 percent on shots 28 feet and farther back. Across the league, teams have embraced the deep three. Still, field-goal averages for most players decrease when they get farther away from the 3-point line. Curry’s 3-point percentage drops from 43.4 percent when shooting inside 28 feet to 32.7 percent outside that distance. James Harden, Damian Lillard, Kemba Walker and other high-volume sharpshooters experience similar drop-offs. But though James is shooting above his career average from 3-point range overall, his 3-point percentage from inside 28 feet is 35 percent — 17.3 percentage points lower than outside that range. That peculiarity may have to do with the way defenders guard James that far out. Generally, a player with the ball in his hands 28 feet away from the hoop is a bigger threat to drive than to shoot. That’s certainly true for James, who drives 11.8 times a game and pulls up from three only 3.3 times a game. All year, James has muscled and blown past smaller and slower defenders on drives to the cup. Knowing they can’t match James step-for-step, defenders sag off to give themselves more room for error — to defend against the threat of a drive. That strategy made sense earlier in James’s career, when he was less of a threat from three, but this year he is making defenses pay. Korver, who turned 37 last month, has relied on 3-point shooting to extend his career. With a career high in 3-point attempts this season, James may be showing signs of what his game will look like as his athleticism begins to decline. A few consecutive misses in James’s final game of the regular season could drop his average below .500. But it’s probably safe to say that his season average from deep will still rank as one of the best since 2000. Only two other players — Jamal Crawford in 2013-14 and Chris Paul in 2016-17 — have hit the 50 percent mark for a season in that time frame. James has hinted at wanting to stay in the league long enough to possibly play with his 13-year-old son, LeBron James Jr. His newfound range from three may just help him get there. H/T to Reddit user HMHype for pointing this out.